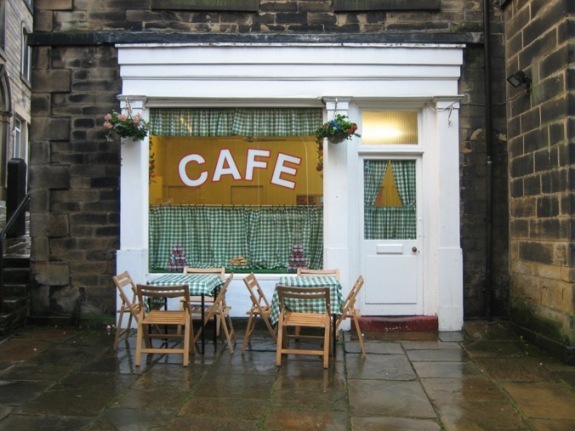 Welcome to the homepage for Sid’s Cafe - the cafe featured in the long running BBC sitcom “Last Of The Summer Wine”. As well as being an internationally famous TV filming location, we are also a fully operational cafe, open from 10 a.m. daily. The ‘useful information’ page will tell you more about our facilities. We sell a variety of hot and cold drinks and freshly prepared food. Choose from a selection of sandwiches and toasties, hot roast beef sandwiches, delicious home-made soup, jacket potatoes, toasted currant tea-cakes, scones and home-made cakes. We also have a range of Last of the Summer Wine souvenirs for sale in the cafe or online - see our Souvenirs page for details. Do come and visit us - you’ll be assured of a very warm welcome.